GERD vs LPR – What is the Difference Between Them? GERD also known as Gastroesophageal Reflux Disease and LPR also known as Laryngopharyngeal Reflux. Both conditions are similar in regard to being related to acid reflux though while both could be directly related to the same root cause for both there are multiple reasons how they can be caused and occur in the first place. First let me cover both individually then I will cover the difference between them after to show the clear difference. GERD is the most common problem with people who have reflux problems. When people eat/drink the valve above the stomach also know as the lower esophageal sphincter (LES) relaxes and remains open then the acid from the stomach will reflux and come up and enter the esophagus. Once this happens this acid can cause irritation and general inflammation in the chest area. It’s this irritation which causes most of the symptoms from a person with GERD. The most common symptoms are heartburn and chest pain. Just like GERD, LPR is brought on by acid reflux and there are a host of causes which can bring it on but the most common one is the same as it where for GERD with the value directly above the stomach which is meant to keep the acid inside the stomach relaxes too much and doesn’t keep the acid in this stomach as it should. The difference when comparing LPR with GERD is that someone with LPR will most likely have issues or symptoms in their throat area whereas a GERD patient will not. This can be a sore throat, a burning sensation in the throat, hoarseness and also a host of others. Check out my article on LPR symptoms for everything covered in detail. Someone who has LPR will have symptoms typically in their throat. The is from the acid continuing to reflux fully up the esophagus and into the throat which usually doesn’t happen with a GERD patient. Most GERD patient symptoms will mainly be focused around heartburn and general chest pain. Whereas an LPR sufferer won’t have the symptoms like heartburn or chest pain usually. This is why LPR is sometimes referred to as silent reflux. 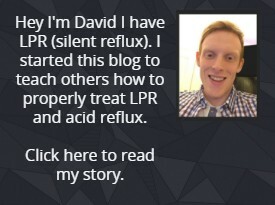 This is because the rest of the reflux is “silent” in the sense an LPR sufferer usually won’t have any symptoms like a typical GERD sufferer would. There is a clear difference between treatment that is effective for both LPR and GERD. Though typically when it comes to LPR most doctors/practitioners tend to treat it as if it where GERD with anti-acid tablets like PPI’s (proton pump inhibiters) which have been shown to be ineffective at treating LPR in studies. This mistreatment is usually because of lack of information on LPR that doctors have been educated on. The same PPI’s when taken by a GERD sufferer will usually show a massive benefit and reduction in symptoms. Of course, there are a host of things for both GERD and LPR which can be used to treat the symptoms though I am just pointing out a common solution that clearly only helps one of the two. If you think maybe you have LPR there is a test you can take called the RSI (Reflux Symptom Index) which can accurately determine you having LPR if you score over a certain amount. I have digitized the test here for you to take. Also, you can check out my complete LPR guide on LPR causes, symptoms and treatment. For GERD treatment there are medicines like I mentioned before that can help though I would prioritize diet and general lifestyle changes. Here is a good diet for GERD sufferers.